I absolutely love the look of it a very rich lush bling finish. Charming and glamorous, the pieces in this excellent collection incorporate a cracked metallic silver texture inlaid on a crisp white background. Each piece is sold individually so you can tailor your set to meet all your needs with ease. These were absolutely beautiful and of great quality!! They actually look better than the picture (tumbler, lotion dispenser, toothbrush holder, and soap dish). The towels, rugs, and shower curtain, however, looked as if they were cheaply made - very thin. I returned the latter. 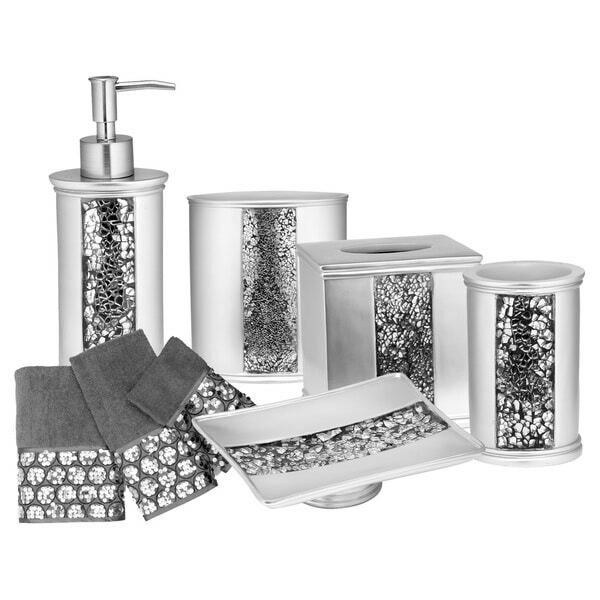 This Luxury Bath Accessory Collection set is gorgeous and looks beautiful in our new bathroom. They are well made and look so elegant in the bathroom. Love the look of this bathroom waste basket. Adds a lovely sparkle to the room. 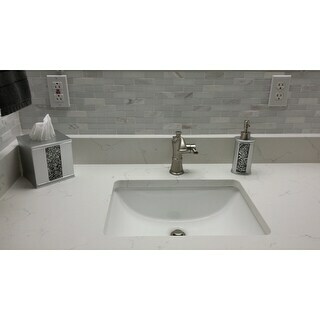 Purchased the soap dish and toothbrush holder that match, pleased with them also. The waste basket is a bit heavier than I thought it would be, however, I really like the overall look. totally lost for words how spectacular this entire set is. This garbage pail is perfect for the color of my bathroom which is grey & shines with sparkles, So rich classy & elegant that is almost 2 pretty for a bathroom. I just admire the entire bathroom set accessories. The set arrived in perfect condition in 2 individual packages. I must compliment this company how they pack each individual piece so carefully?.. truly have never seen a company pack this way...Every company should learn so customer would never have a problem receiving damaged merchandise & have to deal with complaints & returns..
Beautiful luxury bath accessory set. Adds bling to my bathroom. I would have given it a 5 but the tissue holder was scratched on top. This item is worth the money. It is beautiful and has a huffy weight. I was looking for something different to add sparkle to my small powder room; this towel set, with the sequins, is doing the trick. I painted the walls in a dark gray, adding glitter to the paint to help offset the density of the color. These towels help reflect that subtle glitter look, helping make the room look larger. Very pleased with the look! Great addition to my bathroom set. I ordered a four piece collection and needed a tissue box to match. It goes together so well that you can't tell it was never apart of the set. Well made and has a little weight on it, which I like because it won't be knocked over or around on my vanity. Great buy! Very please with this Luxury bath collection. Quality seems to be good. I bought the everything in the collection. The price was also reasonable and I am so pleased with the product. I recommend you to buy today! The product came very quickly and I love it. So beautiful. Pictures dont do it justice. Love them. Very pretty! Great accent pieces for our bathroom. Nice color matches my bathroom perfectly. Looks great, chipped easily when the kids dumped into our garbage can.... :( wish it would have been sturdier for the price. Overall nice match with our bathroom. Beautiful. Quick delivery. Great quality. The only reason I rate it a 3 is because it is ALOT smaller than I thought. "I would like to purchase the tissue holder or order some if not in stock. are there any matching towels too? thank you." Yes, I've seen the matching towels. "do you have any tissue holders left?" Hello Hah0621, the current in-stock availability is listed from the options drop down box. Please let us know if you have additional questions. Thanks for shopping with us. "Is this a polished metal or brushed ? What is the embellishment made of?" Hello derbycitylady61, this is a cracked glass design on a metallic silver background. Thanks for shopping with us! I Like the fact that it's silver and not stainless steel which can rust and water spot.